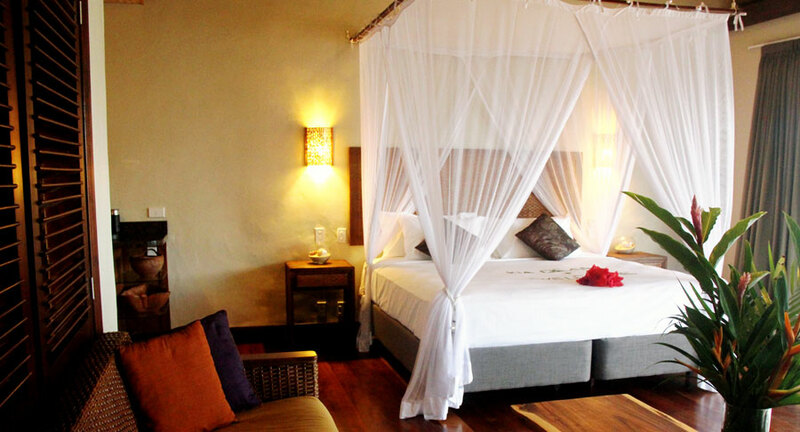 Set amongst the resorts tropical gardens filled with local fruits, you can relax in this contemporary 120m²/1290 sq. 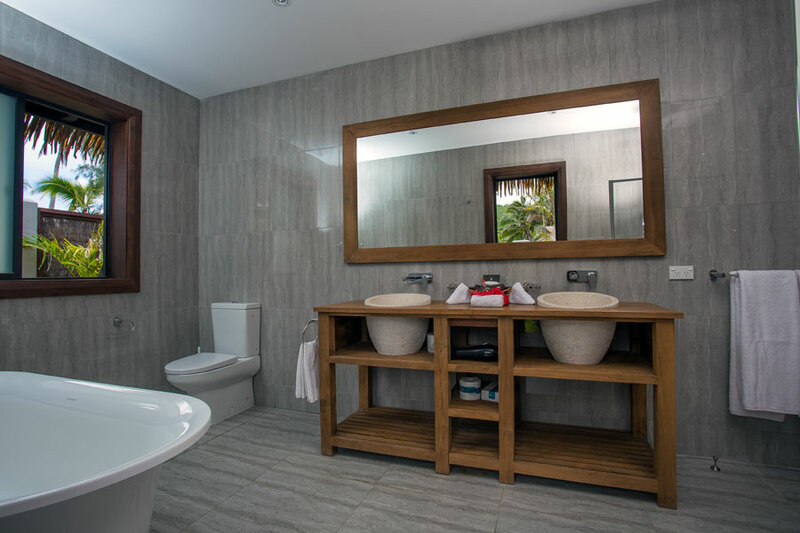 ft. Polynesian Are’ is a suite style room with a spacious private deck furnished with sun lounges and dining suite overlooking your personal salt water plunge pool. 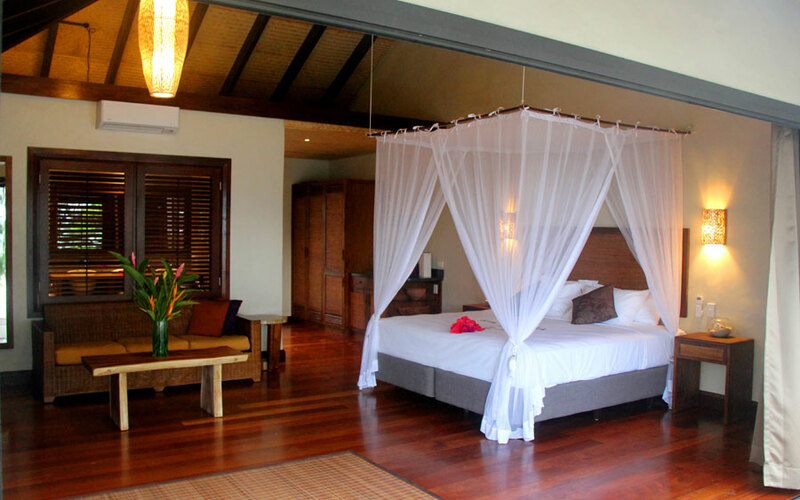 Tastefully decorated with natural finishes, high ceilings and contemporary furnishing all-embracing island styles. Sleeps 2 ad & 1 ch (max). Bedding: Californian King & Single (Sofa). 10 Are' available. Nestled amongst palm trees with the most stunning outlook over the turquoise waters of Muri Lagoon and a step away from the white sands your 120m²/1290sq. 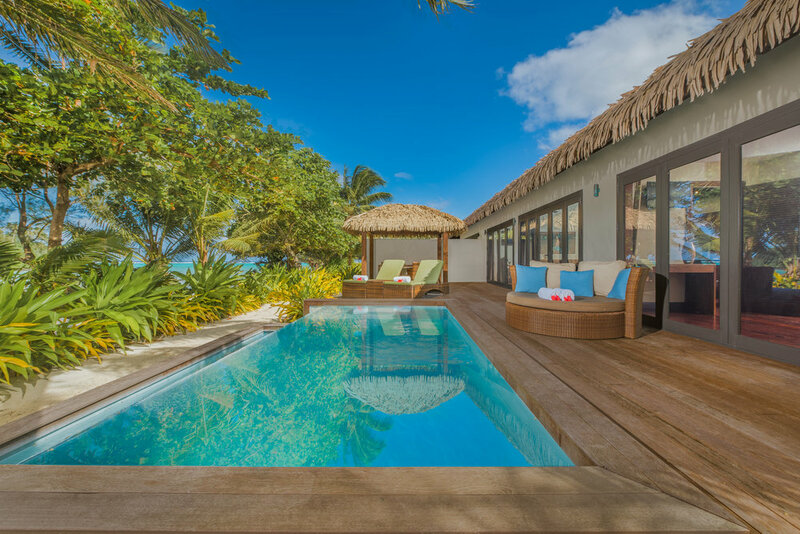 ft. Polynesian exclusive suite style Are’opens onto a spacious deck incorporating your own salt water plunge pool and with lavishly furnished with sun lounges and dining suite. Sleeps 2 ad & 1 ch (max). Bedding: Californian King & Single (Sofa).6 Are’ available. This chic 220m²/2365sq. ft. Polynesian Are’ is surrounded with tropical flora including local tropical fruits. Affording a chic interior spacious enough to accommodate a family or friends in comfort, this Are’ boasts a full kitchen for gourmet entertaining. 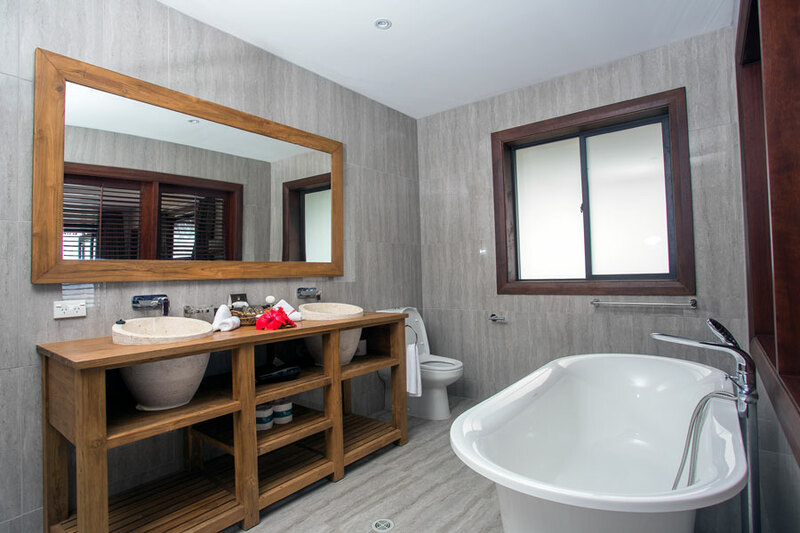 Each Are’ has 2 private bedrooms each with their own luxuriously appointed en-suite incorporating a stone stand-alone bath double vanity and a separate rain shower. An extensive well-furnished private desk is ideal for entertaining, with a personal plunge pool and beautiful garden views. This well-appointed and expansive Are’ presents 220m²/2365sq. ft. of chic Polynesian design with a contemporary furnishings and modern conveniences, perfect for a family or friends. There are spectacular views from the living area, the main bedroom and the expansive private deck and salt water plunge pool of the aqua waters of Muri Lagoon and the white sandy beach is a step off your deck. This Are’ boasts a full kitchen for gourmet entertaining, has 2 private bedrooms each with their own luxuriously appointed en-suite incorporating a stone stand-alone bath double vanity and a separate rain shower. The extensive well-furnished private deck is ideal for entertaining along with the Are’s own large garden courtyard and private beachfront Pagoda. Combining all of the features of the 2 Bedroom Premium Beachfront Are’ and a Premium Beach front Are’, these Are’ interconnect to offer an expansive 3 bedroom beach front option for larger families or groups. This extremely well appointed Are’ presents 340m²/3655sq. ft. of chic Polynesian design with a contemporary furnishings and modern conveniences. The combined features of these interconnecting Are’ offers 3 bedrooms, 3 bathrooms, 2 plunge pools, 2 private decks and 2 private courtyards each with a stone outdoor shower. There are spectacular lagoon and beach views from the living areas, 2 bedrooms, both private deck and salt water plunge pool. And you are only 1 step from the beach. This Are’ boasts a full kitchen for gourmet entertaining and a mini kitchenette in the main bedroom suite. Sleeps 6 ad & 2 ch (max). Bedding: 3 x Californian King & 2 x Single (Sofa) or 2 x Californian King, 2 x King Singles & 2 Single (Sofa)or1 x Californian King, 4 x King Singles & 2 Single (Sofa). 1 Are’ available.